The term "baroque" is from the Portuguese noun barocco meaning imperfect pearl, not round but of unpredictable and elaborate shape, reflecting the style's use of exquisite materials and composition of asymmetrical parts. In informal usage, the word baroque can simply mean that something is "elaborate," with many details, without reference to the Baroque styles of the seventeenth and eighteenth centuries. The latest baroque revival, some call it the 'new' romantic design trend, others refer to it as "baroque 'n roll", is a real treat for the eyes, mixing modern lines with 17th century baroque charm. I'm attracted to modern simplicity anyway, a classy clean sofa (room + board's delancy is nice, especially in dagmar dove) paired with crystal urn lamps, sumptuous textiles (damasks, linens...), an ornate mirror (that was once gilded gold, now is white), and a dressy baroque wallpaper on the walls. This month, Australian Home Beautiful (August), does a nice job spotlighting this trend with clever examples of how to mix modern pieces with baroque-inspired elements in the most pleasing way. 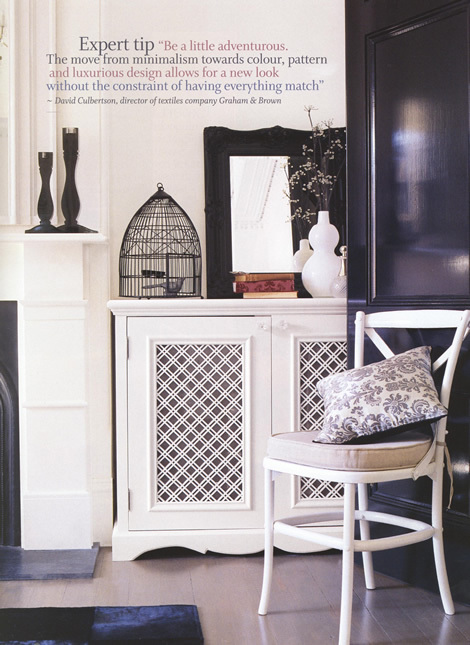 I love how damask softens the lines of modern stark furniture, bringing a bit of personality into the space and uncovering perhaps a little bit of an adventurous streak in the homeowner. 1. Start with black, grey and white as your foundation colors. You build from there. 2. 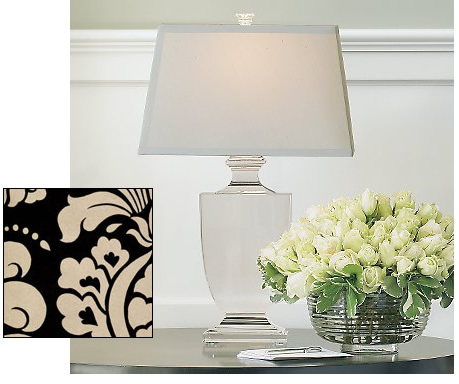 Incorporate metallics (either silver or gold, not both) and/or mirrored surfaces, crystal, or acrylic. This step must be done tastefully. Be careful not to overdo it. 3. Now, you're ready to add bursts of color. Remember, no more than two colors should be added. Stick to romantic hues. For romance, try lavenders and pinks, or blues. For bold, use red, purple, teal, navy blue... I prefer the softer hues myself, I would opt for a soft blue with pink. You can even keep the look very understated by mixing in various shades of grey, beige, white, bits of black, and a touch of pale blue or a bit of chocolate. 5. Avoid going over the top, unless you want your home to resemble Windsor Castle. You don't need 5 statement pieces in a single room. Sometimes, just a few pieces that are carefully placed will give the room that "it" factor you seek. Think of a focal point piece, and then, as I like to do, a "surprise" piece. For instance, when you walk into the room, the focal point may be your amazing sofa. However, once the guests are seated on that sofa, you can have a surprise piece that they wouldn't see unless they were seated on that sofa (or standing on that side of the room). 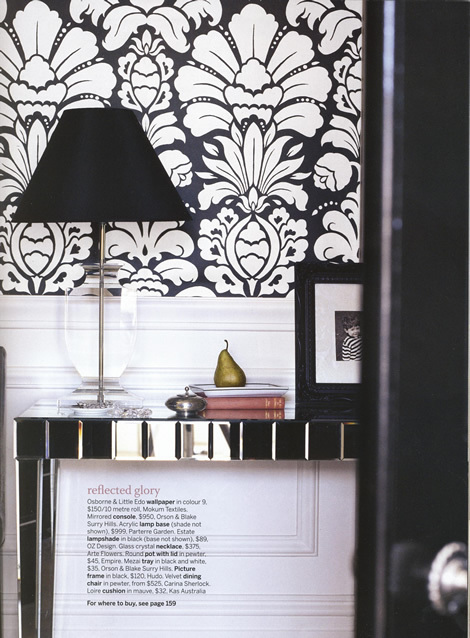 It can be a beautiful mirror over a sleek buffet, a wall of wallpaper, a sassy chair, a great lamp, etc. 6. Home Beautiful magazine gave a great tip on how to give the space a contemporary spin: Mix patterned fabric with bold striped wallpaper in similar colors. Vertical stripes are classic but pick up the clean lines of modern furniture, giving the room height and creating a sense of spaciousness. 7. This trend works best if you use small prints, monochromatic ones, on large pieces of furniture (keep the prints in a single shade). 8. Most of all, have fun and invite a friend over with a good eye, someone who may already have this style going on at home and can offer you some great tips. Order thai, uncork the vino, put on some tunes, and decorate!